Fifty-six Americans worked in Guyana, South America, under the direction of Partners In Progress. A medical clinic was conducted for 5 days at the Bagotville Community Center with the assistance of the Nismes church of Christ. Two thousand two hundred ten patients were examined and treated. Nearly every patient was taught the Gospel and given religious literature. Hundreds of Bibles were distributed. Attendance at the nightly preaching services grew from 125 to 341. Sixty-three people obeyed the Gospel. Boxes ("totes," we call them) of supplies and medications were delivered to American Airlines during the afternoon of the day prior to our departure from Fort Smith. On the chilly Saturday morning of 6 June, the 40 local members of our team arrived at the airport at 5 a.m. Thirty-three are current members of West-Ark church of Christ. Thirty-six departed Fort Smith about 7:30 a.m. on a larger plane provided by American Airlines. Our equipment and supplies not placed on this plane with us were shipped on the following scheduled flight to Dallas. Four in our group had Northwest Airlines tickets, but their flight was canceled. They were rerouted on TWA to St. Louis and onward to Miami. The American Airlines group had a 1-hour layover in Dallas. Two team members from Searcy, Arkansas, joined us in Dallas for our flight to Miami. Sandwiches were served for lunch on this flight which landed in Miami at 2:05 p.m. Eleven Christians from Mayfield, Kentucky, met us in Miami. After reporting to the BWIA International Airways counter at the Miami airport, we located all but one member of the full team. We found her at the departure gate. All 56 team members were on the flight to Guyana which left Miami on time at 4 p.m.
About 5 p.m. we were served supper on our BWIA flight. The menu included a choice of chicken with rice or flounder with potatoes. Also served were green beans, chilled salad of mostly sweet corn with a little lettuce and 2 slices of cucumber, a roll, carrot cake, bottled spring water, and a beverage. The meal was tasty and fulfilling. Following the meal, the team leader collected everyone's airline tickets and baggage claim checks. We had 49 personal bags for the 56-member team. There were 65 totes and boxes of supplies and equipment. On the way to Guyana our plane landed in Trinidad at 7:40 p.m. We remained on the plane and departed at 8:45 p.m. We were then served a chicken sandwich, a Mustang candy bar, and a box of Libby's Orange Drink. Immigration forms were completed onboard prior to our landing in Guyana at 9:35. This year we found that some of the immigration officials were unsatisfied with our claim that we were there on official business with the Ministry of Health. They insisted on writing Church of Christ on the forms. Steve DeLoach and Ivan Persaud met our group at the airport. Luggage and totes were identified and collected. All personal luggage made it to Guyana with us, but only 60 totes arrived. Once it was determined which claim checks matched the missing totes, appropriate measures were taken with BWIA to begin tracking them down. Porters carted out the totes and team members carried out their individual luggage. A large flat bed truck was used to transport luggage and totes to the hotel. Our group was transported by vans. We were informed on Monday afternoon of the arrival of the 4 totes of dental equipment on Sunday. (This equipment was to fly with the 4 who were to travel on Northwest. In the process of changing airlines in Fort Smith, the dental equipment must have taken a late flight.) One of our totes never arrived, but its contents were duplicated in other totes. We arrived at the Pegasus Hotel in Georgetown, the capital city, at 11:45 p.m. We were served complimentary fruit drinks at the hotel while waiting to check in. Our eleven married couples plus 15 women and 19 men required 29 rooms. Having an odd number of men and women necessitated us paying US$50 extra for each of the 2 rooms which had no roommates. Meeting for breakfast at 8 a.m. Sunday, we found a buffet of fried eggs, bacon, potatoes, pineapple, watermelon, bread, juice, and coffee or hot tea. At 9:00 we departed the hotel for the ride to the Campbellville church of Christ building, which will soon also be used as a permanent clinic near Georgetown. (In the past, our team usually worshiped on Sundays with the congregation sponsoring our clinic, but the bridge across the Demerara River was closed to traffic most of the day this year.) The Bible class and sermon were presented upstairs by West-Ark's personal evangelist, Roy Dunavin, who taught about "The Holy Spirit and Miraculous Spiritual Gifts." Downstairs, several in our team presented Bible lessons for the children. Ninety-three people were present for Sunday school and 136 were in attendance during the worship assembly. Here we met the Boosinger and Winder families, new missionaries to Guyana since mid-May 1998. The service concluded at 11:30. At noon we were back at the hotel, where we were served lunch beginning at 12:15. Lunch on Sundays at the Pegasus is not included in the Partners In Progress fee for the trip. (For domestic and international airfare, ground transportation, lodging and two meals per day, team members flying from Fort Smith each paid $1925.00) As usual, most on the team napped or rested Sunday afternoon. The hotel's management hosted a reception with soft drinks for our group at 6 p.m. Supper at 6:30 included chicken, fish, rice, bora beans, bread, water, and a dessert. From 7:30 to 10 p.m. we met with Steve DeLoach for the usual instructions on how to have a safe and effective project. We learned that our group was the 50th team since Steve became the Guyana Coordinator for Partners In Progress in 1992. After the meeting, we separated into groups of Bible teachers and clinic personnel for more focused attention by the personal work and clinic directors, Roy Dunavin and Dr. Michael Cole, respectively. Felicia Wilson was presented a cake for her 22nd birthday. It was also a Sunday night in Guyana when she celebrated her 16th birthday with our medical mission team. After a good night's sleep, we met together for breakfast at 7 a.m. on Monday, 8 June. As is our custom, we had a short devotional. Afterward, we loaded our supplies and equipment onto a truck, boarded vans, and departed the hotel about 8:00. We reached the clinic site about 8:30. For the second year in a row, we set up our clinic in the Bagotville Community Center, where we began seeing patients at 9:45. The clinic was an evangelistic and benevolent outreach of the church of Christ at Nismes, the adjacent village. Many Christians from the Nismes congregation worked at the clinic site throughout the week. Being the rainy season, we had rain every day. In the eight years that West-Ark and Mayfield have been working in Guyana, this was the wettest week, with hours of rain each day at the clinic. While working at the clinic the temperature ranged from 78 to 86ºF. Our medical team also consisted of 3 family physicians, a nurse practitioner, a physician pain specialist, an ophthalmology nurse who was assisted by 5 people trained in eyeglass fitting, a lab tech, a pharmacist who was assisted by a certified medical assistant, a registered nurse and a dental assistant who helped our dentists, and 3 RN's who were intermittently assisted by several Bible teachers who were trained to take vital signs. Doug Winder helped scrub dental instruments all day. Dawn Winder and daughter Danielle assisted with patient flow in the clinic. Andy and Alison Boosinger, both LPNs, helped take vital signs on Thursday. Andy also worked with us on Monday. Balance Bars, Beanie Weanies, Beef Jerky, Boost Bars, Breakfast Bars, Canned Peaches, Cheese Crackers, Clif Bars, Cracker Jacks, Ensure, Fruit Snacks, Gatorade, Gold Fish Crackers, Granola Bars, NutriGrain Bars, Nutter Butter, Oatmeal Cream Pies, Pay Day, Peanut Butter Crackers, Peanut M & M's, Peanuts, Pop Tarts, Power Bars, Pringles, Pudding Snack Paks, Sugar Smacks, Trail Mix, Tuna Salad Lunch Kits, Vienna Sausages, Wheat Thins. Because we used the clinic space to conduct our evening services (which we call "crusades" in Guyana), at the end of each day we had to pack everything up and secure it in our pharmacy. The process of setting everything back up each morning delayed when we could begin seeing patients. Once things were set up, the medical personnel met in the pharmacy for a prayer before seeing our first patient every morning. Everyone who wanted to be seen in our clinic on Monday was allowed in before we closed the line at 3 p.m. On our return to the hotel on Monday afternoon one of our 5 vans broke down due to an electrical problem. Not long afterward another of our vans arrived, from which we removed all the men to allow the stranded women to proceed to the hotel. Most of the remaining men caught a ride in the last van of the day which followed the one having trouble, but had finally started. The last group arrived at the hotel at 4:30 p.m. on Monday. Supper was served daily at 5:30. On Monday we ate from a pizza buffet. We left the hotel each evening at 6:30 to return to the clinic/crusade site. We would arrive between 6:50 and 7:00 p.m. Till about 7:30, we sang together, led by men from our team and by local Christians. Each evening, the youth director from Mayfield, KY, Joe Palmer, with his wife and 3 others went to the village of Industry with Bruce House, resident missionary in Guyana. The audience grew from 30 to 60 during the nightly preaching by Joe on Monday through Thursday. Gary Green and his wife, from Fort Smith, along with 3 other American Christians worked each night with the congregation at the village of Canal Number One. Gary preached to about 30 people Monday through Thursday nights. Not being a preacher, he had not planned to preach while in Guyana. During supper on Monday night, Gary accepted an invitation to speak for the church of Christ at Canal Number One. Roy Dunavin preached each evening at Bagotville, beginning about 7:30. The attendance grew from 125 on Monday evening to 341 on Thursday evening. On Friday evening after our departure, the local preacher, Desmond Zephyr, conducted the crusade. Lights in the meeting room were provided by the mission team's generator. This generator was utilized during the daytime to run some of our clinical equipment. The children were escorted to a room downstairs just before the preaching began on Tuesday, Wednesday, and Thursday nights. They were taught Bible lessons on their level of understanding by some of West-Ark's teens, under the guidance of Glenda Hodnett, a Fort Smith kindergarten teacher. The class could not be conducted on Monday night due to a lack of lighting in the room. The number of children grew from 102 the first night to 197 the last night. Each day, Tuesday through Friday, our young people conducted vacation Bible school type classes at three public schools in the vicinity. On Monday, Glenda Hodnett made arrangements with the headmasters at these schools to begin teaching on Tuesday. The popularity of these classes, along with invitations to attend the evening Bible classes, resulted in many adults bringing their children and attending the evangelistic crusade services in the evenings. Arrangements were made early in the week for one of our van drivers to pick up about 20 delicious Guyanese pineapple at the market each day. The cost to the team was less than 46 cents (US) per person per day. After returning to the hotel after the crusade each evening, pineapple was served chilled and sliced about 9:00 for everyone in our group. Most folks were in their hotel rooms by 10:00 each night. On Tuesday morning we arrived at the clinic about 8:30 and were able to see patients by 9:30. Probably because it rained most of the day, our crowd was smaller than we anticipated for Tuesday. The Guyanese who arrived by 3:00 p.m. received treatment. 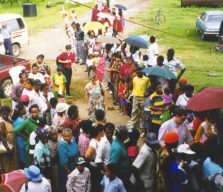 Upon arriving at the clinic, all patients are kept in lines for medical, dental, or eye care. They are given a numbered ticket for the care they are seeking. Little by little they are admitted to the first station where each person's name and address, along with their preference for "M.D." or "Dentist" or "Eye" and the ticket number, are written on the top of our clinic form by a local Christian. This paper is then given to the patient, who must keep up with it till their treatment has been completed. Each patient is then directed to one of our Bible teachers. Everyone who comes to the clinic is offered a one-on-one Bible lesson, but everyone is free to see the doctor whether they study or not. People are treated with the same kindness in the clinic regardless whether they sit through a Bible lesson. After the patient is taught about salvation offered through Jesus Christ or indicates they are not interested in a study, the Bible teacher records information on the patient's clinic form about their religious preference and interest in spiritual matters. The patient is then directed to an area of the clinic for service of their primary health problem. Usually, the patients are seen first by a nurse, then shown where to wait for the doctor. Following completion of an examination and treatment, medical patients are sent to the pharmacy where the clinic forms are kept after medications are dispensed. For dental and eye patients who don't need medicines, the forms are kept by the dentist or nurse to be collected at the pharmacy at the end of the day. Every Christian worker at the clinic invites every clinic visitor to attend the crusade each evening. Our first van load left the clinic at 2:50 p.m. on Tuesday with personal workers who were finished for the day. One of our vans stopped at a jewelry store on the way back to the hotel to shop. The last van left our clinic site at 4:00 on this day. There were 6-inch, tree-ripened bananas available at lunch on Tuesday at the clinic. At supper at the hotel this year we had an option of hamburger and fries. Others on Tuesday night ate from the buffet of fish, shish kabob, rice, salad, plantain, soup, bread, and cold bottled water. Upon returning from the evening services Tuesday, we had pineapple and mango. The mango was a gift from a patient to one of our team members that day. One of our physicians was suffering with a kidney stone on Wednesday, so was unable to leave the hotel. (The stone passed that afternoon, so on Thursday he was able to return to work.) Upon arrival to the clinic Wednesday morning we found hundreds of people waiting. We were able to begin seeing patients by 9 a.m. following our daily prayer at our pharmacy. This was a very busy day with 514 patients, more than the West-Ark and Mayfield team had ever seen before in one day in Guyana. We cut off entrance from the line at 2:45 this afternoon, and saw our last medical patient at 3:50. Dental patients were not finished till after 4:00. The last van, which is always filled with medical personnel, arrived back at the hotel at 4:50. Wednesday morning at breakfast we had steak. On the buffet for supper Wednesday night was fish, sweet and sour pork, rice, egg rolls, and salad. For dessert we had cubes of watermelon, pineapple, and papaya. Roy Dunavin preached for 50 minutes Wednesday evening. There seemed to be more mosquitos this year. We had bats flying overhead during the preaching on more than one night. We returned to the hotel at 9:00 Wednesday night. Thursday morning we discovered the hotel elevators were out of order. For breakfast we had scrambled eggs, bacon, potatoes, pancakes, bread, juice, and coffee or tea. The first morning van left 10 minutes early to allow some in our group to get everything set up. It was 9:00 when we saw our first patient. The temperature was 80ºF at the clinic when we arrived. This was the first morning that it wasn't raining when we got to the clinic, but there was a brief shower at 11 a.m. The last van departed from the clinic at 4:20 p.m. after a record 561 patients were seen by our team. We arrived at the hotel at 4:50 and found the elevators were now working. After supper, one of our doctors went to an orphanage to examine a sick child. On Thursday night a brightly-colored snake was killed near the foot of the stairs immediately following our evening service. Since this was our last night in Guyana, our departure for the hotel was a bit later than usual. At the hotel we enjoyed our last evening of fresh Guyanese pineapple. We visited around the poolside while enjoying the steel pan drum band. Most in our group retired to their rooms early to begin packing for Friday's departure. Friday's breakfast consisted of omelettes, sausage (which looks and tastes like hotdogs to us), potatoes, pineapple, watermelon, bread, juice, water, and coffee or hot tea. Our doctors left 3 people at the hotel this final day because of sickness and concerns of possible pending sickness. When we left the hotel at 8:00 it appeared that it was going to be a great morning with no rain, but it was sprinkling by the time we arrived at Bagotville. It was dark much of the day in the clinic due to an overcast sky from which we occasionally heard thunder. The temperature stayed around 80ºF most of the day. Many people came to the clinic on Friday just for Bible studies. Many studied with more than one of our Bible teachers throughout the week. Two dozen people made the commitment Friday to serve Jesus Christ by being immersed for the forgiveness of their sins (Colossians 2:12; Acts 22:16). Again this year we used a local water tank cut in half for a portable baptistry set up close to the clinic. Baptismal garments were borrowed from West-Ark church and shipped with our supplies from the States. One room at the clinic site was set aside for a changing room for new converts. As usual, there were people standing in line when we closed the clinic Friday who needed to be seen, but couldn't. This final day we had to shut down the line at 2 p.m., one hour earlier than previous days, in order to start packing everything away. Most of the supplies that remained at the end of the week were left in Guyana for future Christian projects. Though it rained much of the day, Saturday was spent resting, shopping, bird-watching, eating, swimming, sightseeing, and relaxing in Trinidad. Sunday morning everyone was up very early to check out of our rooms at the Trinidad Hilton. We met at 5:30 in one of the hotel conference rooms, where we had a communion service till 5:55. Buses picked us up in front of the hotel at 6 a.m. for the return trip to the international airport. We were all on board the plane by 8:15. Four people in our team had to sit in first class to Miami, where we arrived about 12 noon. Sunday evening, most of the team returned safely to their families in Fort Smith, Arkansas, or Mayfield, Kentucky. We also had people from Searcy and Benton, Arkansas; Roland, Tahlequah, and Chouteau, Oklahoma; Dallas, Texas; and Miami, Florida. We give God the glory, honor, and praise for His abundant use of our talents to serve Him and those He loves in Guyana. Britney BEARD, Pat BEARD, David BERGER, Sandy BERGER, Michael BLASDEL, Liz CATHEY, Janet CATHEY, Jane CHOATE, Jeannie COLE, Michael COLE, M.D., Steven COLE, Lloyd COPPEDGE, Beth CRAIG, R.N.P., David DICKEY, Brent DUNAVIN, DDS, Joyce DUNAVIN, R.N., Roy DUNAVIN, Bob FISHER, M.D., Rupa GOOTAM, Gary GREEN, Judi GREEN, Larry GREEN, Janet GRIMES, R.N., Mitch HARPER, DDS, Glenda HODNETT, Bart JONES, Donna LAREY, Keith LAREY, Mary June LEWIS, R.N., Cindy MEEKS, CMA, Randall MORGAN, Darrell MOSES, Robertta MOSES, Terry OVERBEY, Blake PALMER, Carolyn PALMER, Joe PALMER, Debbie RAY, Keith RAY, Larry ROPER, Wes ROPER, Nolan RUSSELL, Billye RUSSELL, Chuck RUSSELL, Jason STEWART, Shelley TROTTER, R.N., Jay TROTTER, R.Ph., Meagan TURPIN, Lori VENICE, Tony WARD, Will WATSON, Felicia WILSON, James WORD, M.D., Doyle WRIGHT, Med. Tech., Judy WRIGHT, R.N., Steven YOUNGER, M.D.